Here is another example for you to use in your own photography. This photo is a shot of my daughter taken in my pool. It has a really cool water effect created by a super-fast shutter speed. Try this and I guarantee you will get a lot of great comments. As you can tell from the settings above, this picture is all about a super-fast shutter speed. I used 1/8000 of a second as my shutter speed, but you can get away with as slow as 1/1000. 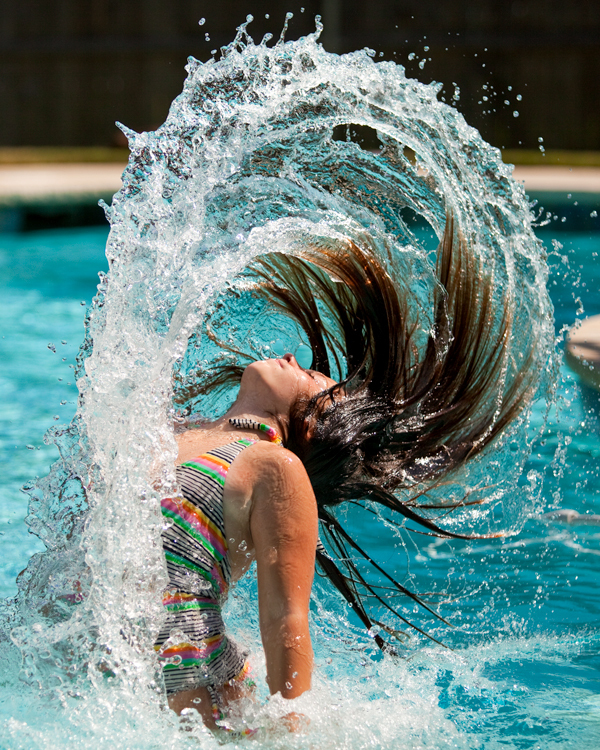 Have your subject bring their head out of the water, flipping their hair backward. It helps if your subject has long hair. As they do, take your picture. More on that in a second. First, let’s get your exposure settings set up. For this shot to work, the main thing is to make sure your shutter speed is set between 1/1000 of a second and 1/8000 of a second. Many cameras actually only go up to 1/4000, but don’t worry because that it plenty fast for this shot. Even on a bright, sunny day, you are doing to have to play around with your settings to get a shutter speed that is fast enough. As you can see from the settings, I was using a fast lens (the aperture opens up to f/2.8) opened up all the way. Even then, I still had to kick the ISO up to 250. And this was a bright sunny May day in Texas. It doesn’t get much brighter than that. I could easily see you having to use an ISO of 800 to get this shot. But don’t skimp because you are worried about noise! Do whatever you need to get the fastest shutter speed you can. Get low by the side of the pool. You want to be shooting sideways at your subject to the extent possible, and not looking down on them. As noted previously, have your subject bring their head out of the water and flip their hair backwards. Do not just hold the shutter down and blast away indiscriminately, no matter how many frames per second your camera takes. It will not work This shot is about extremely precise timing. In my experience, and this might sound weird, but you will just feel it. So basically, you are going to need to be like Luke blowing up the Death Star. You may have to impose upon your subject and have them come out of the pool a few times to get it right. Here is another shot I took on the same day using the same techniques. I did almost no post-processing to this picture. I cropped the sides in, and did very minor contrast and saturation adjustments and that’s it. Post processing won’t significantly help this picture. Either you nailed it, or you didn’t. Once you know how to do it, this type picture is not that hard to do, and can yield amazing results. Out of all the pictures I have taken, this one is certainly top 5 in terms of nice comments. By the way, if you don’t have a pool, all is not lost. I have seen really cool pictures of water effects taken at other places, such as a lake and even on a slip-and-slide. Not long ago, I saw a picture of someone using the back side of a Frisbee to flip water over their head. So just use what you have and be creative.